Tribal nails! I got to thinking about tribes and history and eventually started thinking about cave paintings. 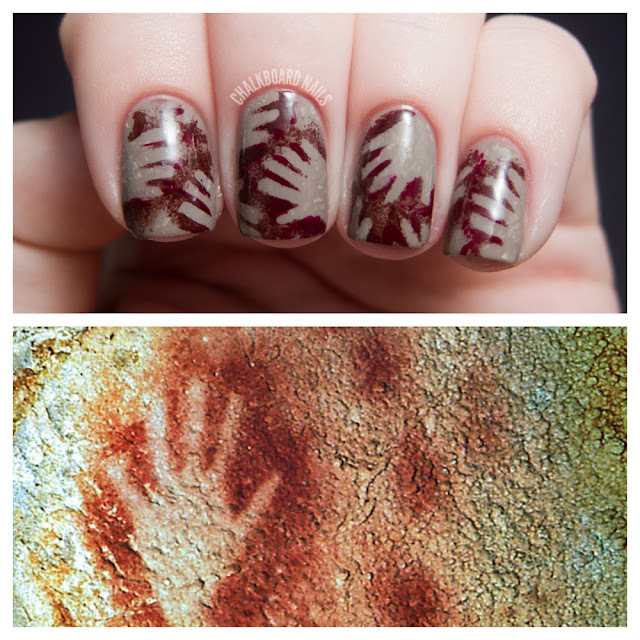 I recalled these beautiful stenciled hand paintings on cave walls and wondered if there was some way I could get them on my nails. Here is an example of the style I am referring to, though there are many many more images of this style of cave painting. 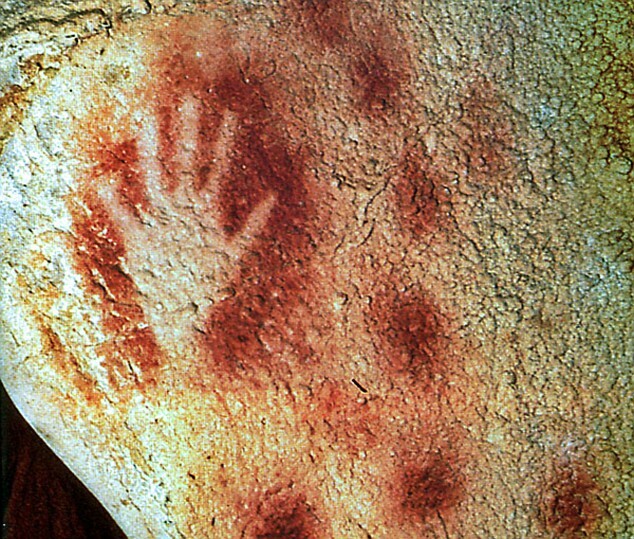 Try googling "cave painting hands" for some excellent and beautiful images if you are interested. I started out with a base of OPI Berlin There Done That, which I also tried to texture a bit with OPI Don't Pretzel My Buttons. Then, I blocked off areas of my nail with hand shaped pieces of painters tape, and used a sponge to sponge on China Glaze Call of the Wild over the tape, around the edges. I then added a bit of freehand embellishment with China Glaze Velvet Bow to give the stenciling a bit more depth of color. The tape pieces were created using the same method that I used in my stenciled star nails tutorial, except instead of using a hole punch like I did for that manicure, I just freehand cut out some hand shapes. For having never done something like this before on my nails, I think I did a pretty good job of mimicking the cave paintings. If I were to attempt this again, and I would like to, I would probably sponge each hand on in different shades of reds and browns, and try to make the base look more like stone. I hope you enjoy these like I do! 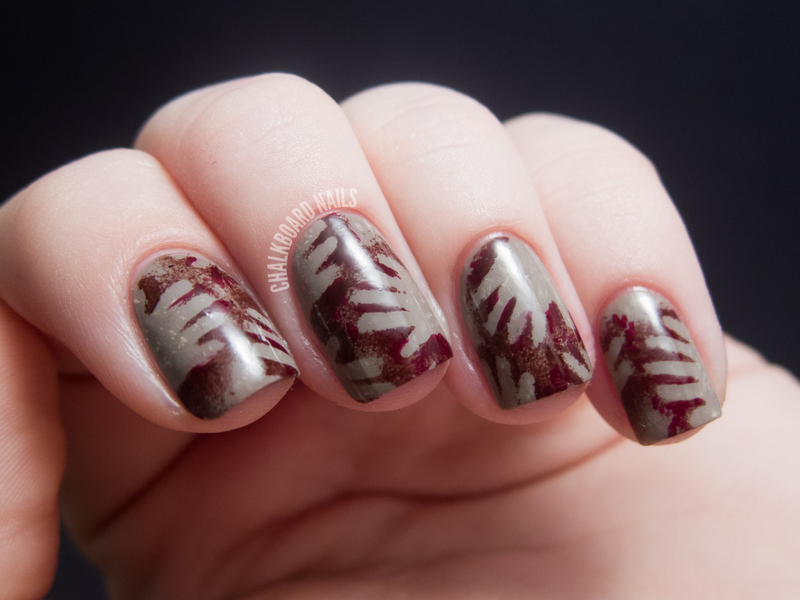 You can check out last year's tribal nails here as well as the challenge prompts here. I love your posts this time around. Indeed, outside of the box! So creative! I am in love with these!! What a neat interpretation of the tribal theme, very creative! wow. your creativity is astounding. just wow. This is so clever and creative- I love it! Wow!!! What a great take on "tribal"! I love it!! So creative! I love how you're always thinking outside the box! Amazing! I so want to replicate your design to celebrate the birth of my new baby! love it - very original and you pulled it off well! I love this; very creative. You did an awesome job. Great color combos too. 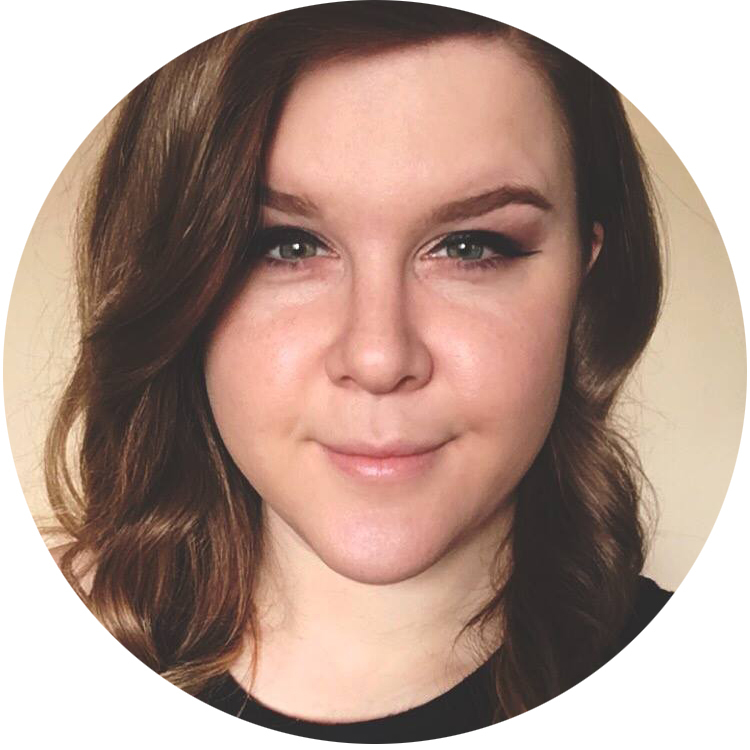 I love that your're being so creative with the prompts for this challenge! This one turned out great. Fabulous & unexpected! Love it. I'm going to try this!! This is so wild!!! Wow, that's amazing! I have no idea how you managed to cut so many perfect little hands out of tape, you must have amazing patience. I love your spin on this theme. This is a great idea!!! Very "Australian aboriginal art"-esque! And yes you did an awesome job. Awesome! This reminds me of Australian tribes. Omg... ! The idea itself is just amazing ! Never seen something like that. 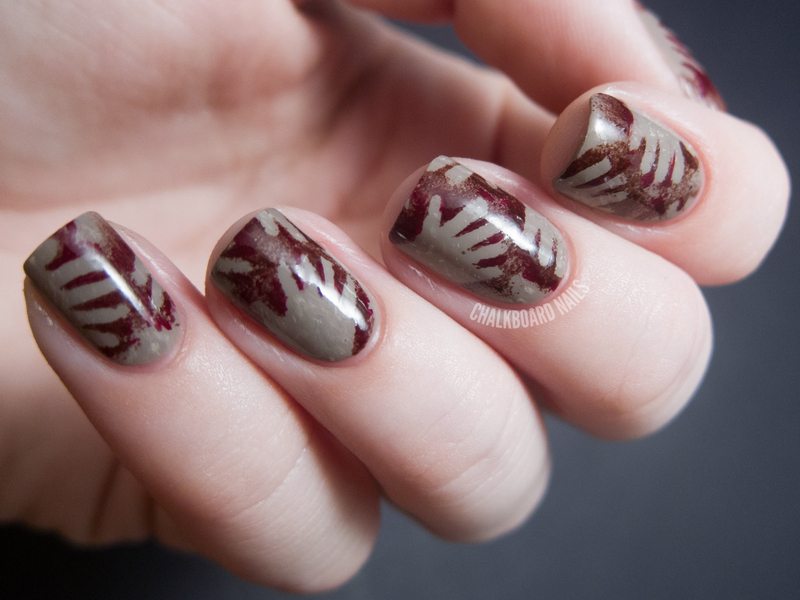 This is very interesting and not your usual tribal mani out there. Great work! This is so amazing and adorable! I love this so much! Normally, you get so many comments, I think "well, she won't need another one from me" but I just had to this time! This is so unique and special, it just blows my mind. My husband is working in Australia, and this reminds me of their aboriginal art. What a great job! Brava! Oh my god these are so amazing!!! The patterns on your nails are wonderful. Did you used to have one day nail polish brand Yves Rocher? This is amazing & unique, love it! Incredible and so well thought out, well done to you for being original! This reminds of the beginning scenes in Ferngully. Now I know where those scenes where inspired from! Oh I LOVE this! So creative and well done!